Gastric Dilitation Volvulus (GDV), also known as "Bloat", is a life threatening emergency most commonly seen in large breed dogs. During GDV, the dog's stomach becomes distended with air and then becomes twisted. The twisted tissue loses blood supply, leading to severe shock. There is no easy way to predict which dogs will develop bloat, although it is more common in certain breeds. There are many theories as to how bloat develops. Some believe that a dog that eats or drinks a large amount and then exercises may be more prone to bloat. Other evidence suggests that there is an abnormality to the stomach contractions which causes the air the become trapped. Breeds more at risk for GDV include: Great Danes, Saint Bernards, Weimaraners, Golden Retrievers, German Shepherds, Wolfhounds, and Bloodhounds. These are all large or giant breeds with "deep chests" (meaning that there is a larger abdominal cavity for the stomach to rotate). Distended looking stomach, may be especially prominent on the dog's left side. Abdominal pain. Some dogs are tender if the belly area is touched while others may show pain by getting into a "prayer position". "Prayer position" means the pet stands for long periods of time with the forelimbs bent downward and the rump up in the air (not to be confused with a play bow). A large breed dog with the symptoms listed above is very suspicious for GDV, but an x-ray of the abdomen will confirm the diagnosis. 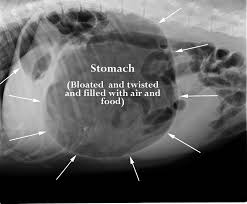 Below are examples of dog abdominal x-rays. The picture on the left shows a normal abdomen with the major organs labeled. The picture on the right shows a severely bloated and twisted stomach. The distended stomach puts pressure on the large veins in the abdomen which carry blood to the heart. Decreased blood flow means the tissues of the body are deprived of oxygen. Without oxygen, tissues will begin to die and the stomach wall may rupture. Digestion stops during this process and toxins/bacteria from the GI tract may get absorbed into the bloodstream causing fatal widespread internal blood clotting. Treatment must occur fast and aggressively. Large quantities of IV fluids to combat shock (some dogs may require multiple IVs at once). Removal of the gas from the stomach. If the stomach is only distended, gas may be relieved by passing a tube through the mouth and into the stomach. If the stomach is already twisted, a tube cannot be passed this way. If the stomach is twisted, emergency abdominal surgery is needed to relieve gas and rotate the stomach back into the proper place. Severe cases of GDV may require surgical removal of the spleen as this organ can also be damaged by the twist. If the stomach has ruptured or the stomach tissue has died due to loss of blood flow, these areas must be repaired or removed during this time. This surgery is very risky as these pets' bodies are severely compromised and at risk for shock and blood loss. Additional medications such as antibiotics, anti-nausea medications, and pain relievers are necessary during hospitalization. Even is surgery goes well, some pets will die soon after due to heart arrhythmias or sepsis. There are several tips for preventing bloat, but bloat and GDV can still occur in some dogs even when all these rules are followed. Large breed dogs should be encouraged to eat slowly either by offering small, frequent meals or employing a "maze bowl". Large breed dogs should be preventing for guzzling large quantities of water at one time. Heavy exercise should be discouraged for a few hours after meals. A surgical procedure called a gastropexy can be performed. During a gastropexy, a portion of the stomach wall is attached to the inside of the chest wall. The goal of this procedure is to prevent twisting of the stomach, although bloat can still occur. A gastropexy is commonly performed during emergency surgical correction of a twisted stomach or some people will elect to have this done prophylactically in their large breed pets. We are closed for lunch from Noon to 1:30 pm daily.